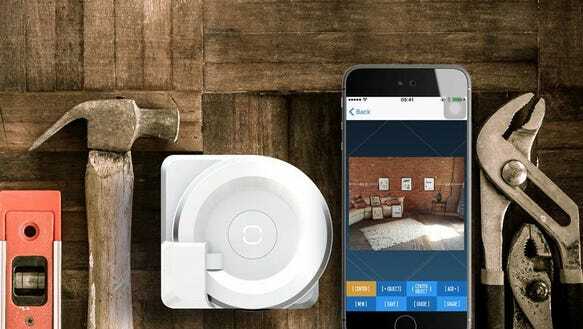 Are these connected home gadgets smart or stupid? Call me old-fashioned, but at times I can be skeptical of smart home gadgets. I like staring at my phone as much as the next guy, but I’ve grown accustomed to doing certain things non-digitally—and I’m not always easily convinced that should change. I’m also highly critical of any smart item that makes a task, well, more difficult, or creates a solution for a problem that doesn’t exist. Haha indeed, Mr. Editor, Sir! My mission was clear, my mind open. I’d check out this smart home nonsense and we’d see who had the last laugh. I’m drawn to nature and green spaces, so I found myself heading first for the booth that was topped with something leafy. Was that… was that… a tomato plant? In a convention center?? The short answer? Yes. 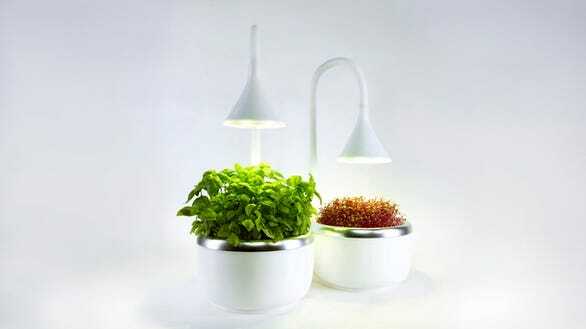 I had successfully located SproutsIO, a smart indoor growing system. It’s great to grow your own produce, but I associate it with a lot of work (digging, watering), dirt, and failure. SproutsIO is cool because it supposedly eliminates those chores. The combination hydro- and aeroponic system involves no dirt, and basically takes care of your plants for you after you add the initial seeds and nutrients. What’s extra cool, though, is what SproutsIO calls “Personal Produce.” Basically, the grow system talks to a smartphone app that lets you track your plants and actually customize them to your preferences. That means if you like your tomatoes extra-sweet, SproutsIO claims it will customize the growing environment to make your tomatoes sweeter. Chefs—like Barbara Lynch, who I was told had ordered units for all her restaurants—are fans of the product. And, uh, I haven’t actually grown anything with it, but I think I might be a fan too. It’s nice to look at, and I like the idea of focusing on adjusting produce to fit your tastes, rather than spending your time losing a guessing game called, “How much water does this plant need?”. The good folks of GeniCan were the most enthusiastic people I met at the show—which is impressive, when you think about the fact that they were there to show off a $150 garbage can attachment. 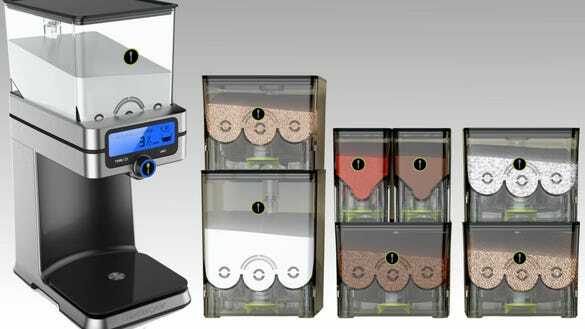 The device is essentially a smart bar code reader that attaches to the side of your existing kitchen garbage. You can scan items when you throw them out and they’ll be added to a grocery list on your phone. You can also set up items to automatically ship from Amazon when you scan them. “But what happens when you scan an item that doesn’t have a barcode?” asked the company cofounder who was walking me through the process. He picked up a lemon, and held it in front of the GeniCan attachment. Guys, GeniCan can talk to you. The trashcan spoke to us in a pleasant female voice. “What may I add to the list?” she said. The man leaned toward the can, beaming. “Lemons!” he yelled. It was impossible not to grin. 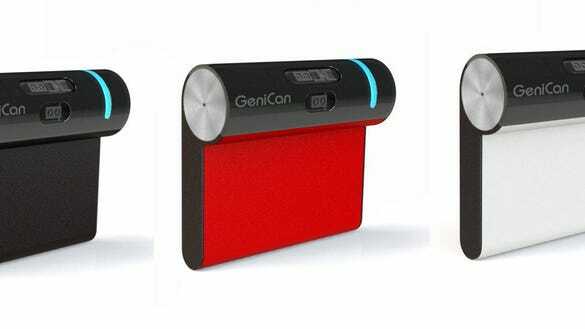 Quite honestly, GeniCan is ridiculous. I’m really glad to have witnessed a conversation between man and trashcan, but I also think I’ll be sticking to manually entering my grocery list into my phone’s notes app, seeing as it’s free and uncomplicated. Some cooking gadgets lend themselves to technological advancement. Others are the gas grill, which I assume has been more-or-less the same since day one. Until now, at least. I made my way to the Char-Broil booth to take a look at their smart grill. I was prepared to find it incredibly stupid, because I feel like summer barbecues should stay low-tech, and I also think that part of their charm is the way they center around the person manning the grill. The thing is, I don’t think the SmartChef grill is meant for casual grillers. It’s for people who take grilling very seriously, and for those people, it kind of makes sense. Say you want your meat cooked perfectly. You can set the grill to a specific temperature and it will maintain that temperature. You can use guided cook modes to follow specific recipes from the companion app. 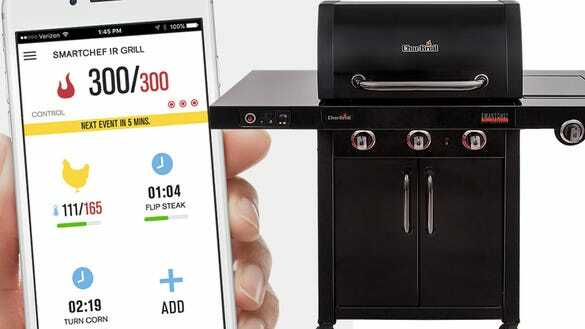 You can also monitor your food from your phone, which means you don’t have to open the lid of the grill to check on it and lose valuable heat. And the burners are individually controlled. My parents wouldn’t bother with this grill, nor would I, but I know some serious outdoor cooks who would adore it. Friends—this one impressed me. The men I talked to described Plott—a combination of smart tools and a companion app—as “mixed reality”—that is, a way of planning out a real project virtually and executing it in reality. Basically, if you’re trying to plan out how you’re going to hang pictures on a wall, Plott helps you import an image of the blank wall and place the pictures on it—to scale. You can then change the layout until it’s perfect, and Plott will help you hang the pictures on your real wall in the exact location you chose virtually. You can use Plott to plan gardens or renovations, check out how appliances will look in a kitchen, or pull in a Google Map of your outdoor space to plan out landscaping. As a person who tends to move a lot, bouncing from one rented apartment to the next, I’d probably never use this. But I think there’s a specific type of tech-savvy, DIY enthusiast/perfectionist who would go crazy for it. If nothing else, I’ve never seen anything like Plott—and that’s a good thing. I’m much more of a trial-and-error kind of cook, so I’d rather be let loose in the kitchen with a bunch of ingredients and—at the most—an ordinary recipe, but it’s hard to deny that the Heston Cue has an appeal. 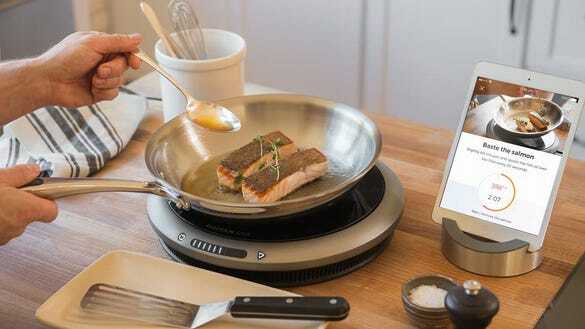 The cooktop and pan connect to an app that’s bright and well-designed, with recipes that take you through them step by step. Most pages have videos that show you how to do things like correctly dice an onion instead of just instructing you to get dicing. When you complete the task, you hit a button at the bottom of the page and it takes you to the next step in the process, and it turns on the cooktop at the right moment in the recipe, adjusting temperature for you. Folks like me who like to experiment—you can also just use the app to set an exact temperature for the cooktop and keep it there—a sensor in the pan makes sure temperature is accurate—or even use the cooktop on its own if you’re not looking to track temperature. It seems like a great tool for people who are interested in cooking great food but want to make sure it comes out perfectly without having to worry or figure anything out. Personally, I’ll stick to my ordinary rangetop—unless someone wants to get me the Heston Cue for a gift. You can preorder the cooking system for $499, and if you’re interested, you might want to hop to it—the gadget will retail for upwards of $600 in stores. What can I say about PantryChic? It brings out my surly side, my “get off my lawn!” side, my capable-of-doing-things-with-my-hands side. 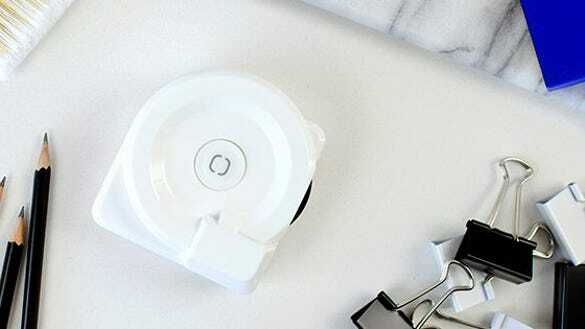 PantryChic is a device that measures your dry ingredients for you. If you’re baking, you can store your flour in a PantryChic container and set it atop a dispenser when you need it. Plug in the amount of the ingredient required, and the PantryChic dispenses it right into a bowl. I have so many great memories of measuring out ingredients when I baked as a kid. Packing brown sugar into a cup, licking my fingers. Sneaking an extra scoop of chocolate chips into the bowl because everyone knows that more chocolate is always better. Scraping the back of a knife carefully across a measuring cup to level a scoop of flour, the white dust soft on my hands. Why are we trying to make baking less interactive? To me, it’s all about getting close and personal with the ingredients. Getting your hands dirty. So what if I have to wash a few more measuring cups or zero a kitchen scale a couple of times? I saw a lot of connected tech on the show floor, and some of it was enormously clever. Some of it was on the right track, but overcomplicated things, or didn’t cater to real needs in an effective way. None of it was quite right for me, your surly-yet-charming skeptic. But you know what? That’s okay. It’s good to see what’s out there.